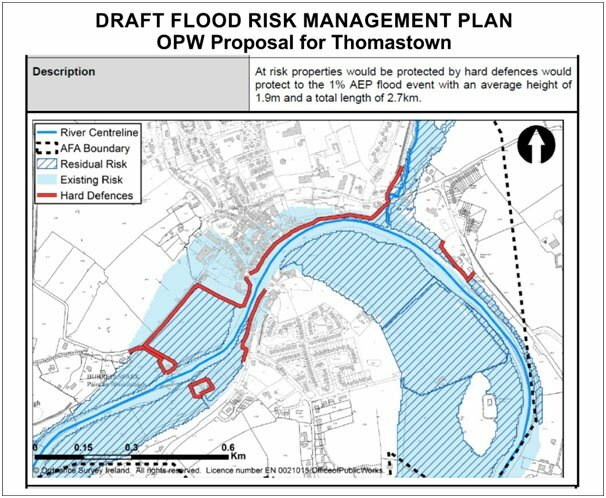 Submissions on the Thomastown Draft Flood Risk Management Plan have to be made to the OPW by 5 p.m. on Friday October 28th. Council Submissions are due by November 21st. (b) the wider catchment or regional scale? Question 3: Do you think that the right balance is provided between the different types of measures proposed in the draft Flood Risk Management Plan? Question 4: What measures or areas do you think should be given the highest priority in progressing measures to manage the flood risk? Question 5: What role do you see you or your community playing with regard to the management of flood risk in your area? Question 6: What do you think can be done to improve the co-ordination of river basin water quality and flood risk management planning? (c) planning for the management of flood risk? Question 8: Do you agree with the conclusions of the environmental assessments? Question 9: Are there any further significant environmental effects of the draft Flood Risk Management Plan which you think should be considered? Question 10: Are there further environmental opportunities or mitigation measures that should be considered in the Flood Risk Management Plan?